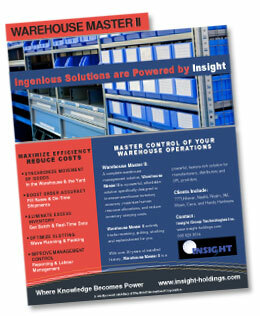 Warehouse Master II™ A complete warehouse management solution, Insight Group’s Warehouse Master II is a powerful, affordable solution specifically designed to increase warehouse inventory accuracy, maximize human resource allocations, and reduce inventory carrying costs. Developed by professional logisticians, Warehouse Master II actively tracks receiving, picking, stocking and replenishment for you. With over 20 years of installed history, and used by over 100 corporations around the globe, it’s a powerful, feature-rich solution for manufacturers, distributors and 3PL providers.